Expect to see the future flight training, including TRACE instructional technology, a "connected airplane," the VTO Helicopter Simulator, and RedHawk training aircraft. The summer airshow season has finished, but the Redbird team is hard at work preparing for the company's flagship event: The Migration Flight Training Conference. Migration will be held October 27-29, 2014 at Redbird's San Marcos Skyport training laboratory. This fall's event will be the fourth Migration conference, and will offer more interactive sessions and more topic areas than ever before. The four most important topics will be student-led, experiential learning in simulators; a “connected” airplane that plays a direct role in student training, the economics of all-diesel training fleets, and motion simulation's role in reducing primary helicopter training times. "Migration is where we open the doors to our customers and show how specific Redbird products or projects fit into our ultimate goal of revitalizing the industry," says Charlie Gregoire, VP of Sales and Marketing for Redbird Flight Simulations. "For example, the Flying Challenge Cup was a terrific success. It proved TRACE technology can teach pilot skills without an instructor on board, so we'll build on that system for our Guided Independent Flight Training, GIFT, system. However, it also showed how our efforts to reach potential pilots fell far short of our needs. So it's time to break out from traditional challenges and find new ways to reach tomorrow's students." 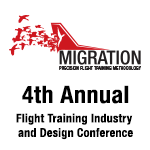 To find out more about the Migration Flight Training conference, sign up for the mailing list at migration-conference.com.